Visit Santiago and Chile’s north and south in this amazing itinerary. Beginning in Santiago, you will have a city tour and vineyard excursion, and then head north to Atacama, the driest desert in the world. Atacama offers archaeological sites, salt lake lagoons, and geysers. You will continue south to Torres del Paine National Park, which features granite peaks towering above mountain lakes and glaciers, and provides a breathtaking natural setting for hiking and other outdoor activities. Lodging and Meals: This tour includes accommodations for 9 nights (3 nights in Santiago, 3 nights in Atacama, and 3 nights in Torres del Paine), and 17 meals (9 breakfasts, 4 lunches, and 4 dinners). 4 Star, 5 Star and Deluxe accommodations include 22 meals. Best Time to Go: October-April. Destinations: South America, Chile, & Patagonia. Interests: Adventure, All-Inclusive Properties, Culture & History, and Wine Tasting. 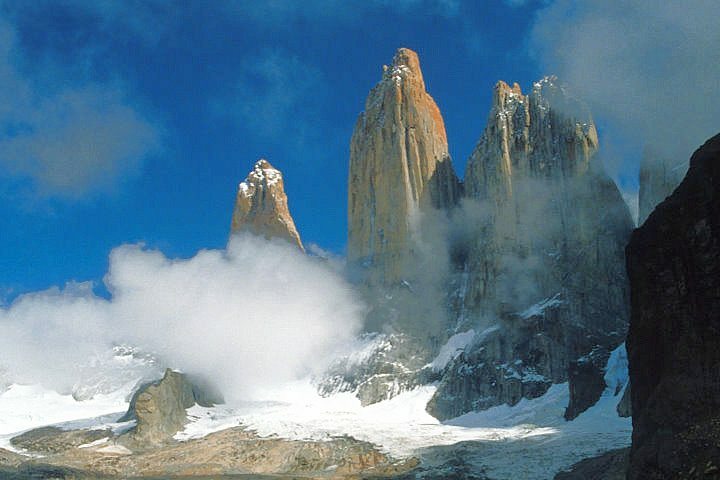 Places Visited: Santiago, the Atacama Desert, and Torres del Paine National Park. 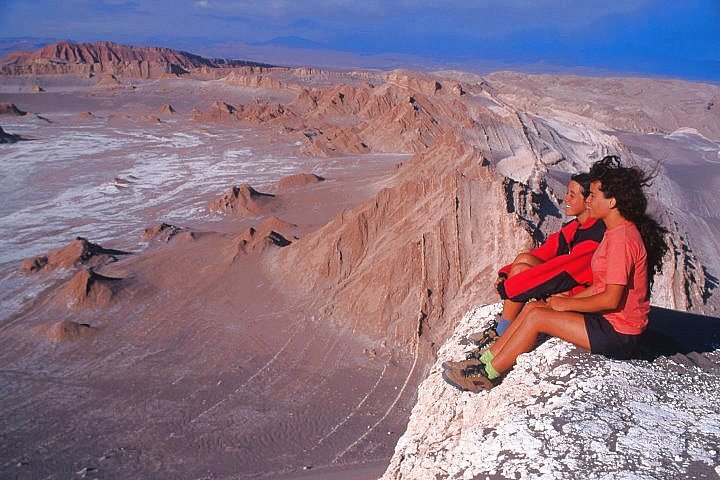 Note: The itinerary below reflects our suggested excursions for the Atacama portion of the tour. The exact order of the tours may vary, depending upon your arrival date. Excursions in Atacama for 4 Star, 5 Star, and Deluxe accommodations are offered on an a la carte basis, meaning you can choose from a number of different alternatives. Depart to Santiago via overnight flight. Note: Check-in time is 2:00 PM. We can request early check-in but cannot guarantee it. Day 3: Santiago-City Tour-Winery Tour. In the morning, you will have a panoramic city tour of Santiago, which will include Parque O’Higgins, Plaza de Armas (the city’s historic center), Palacio de la Moneda, ex-National Congress, Mapocho Station Cultural Center, Santa Lucia Hill, the place of Santiago’s founding in 1541,and the Bohemian district of Bellavista. Day 4: Santiago-Atacama-Salt Mountains-Moon Valley-Mars Valley. Day 5: Atacama-Toconao-Atacama Salt Lake-Chaxa Lagoon-Minique and Miscanti Lagoons. Today you will have a full day excursion to the Altiplanic Lagoons. One the way, you can see the impressive Licancabur Volcano, and will stop at the oasis town of Toconao, known for its Liparita (volcanic) stone houses, which are quarried nearby. The town also features the Church and bell tower of San Lucas, which dates to the mid-18th century. You will also visit the Atacama Salt Lake and Chaxa Lagoon. The Lake is an important nesting site for three species of flamingos, and contains 40% of the world’s lithium reserves. Box lunch. Day 6: Atacama-Tatio Geysers-Puritama Hot Springs. Day 8: Santiago-Punta Arenas-Torres del Paine. Day 9: Torres del Paine. Day 10: Torres del Paine. Day 11: Torres del Paine-Punta Arenas-Santiago. Group Private: All airport transfers in Santiago are private, and the city tour and winery tour are group tours for single passengers and 3 Star accommodations, and private for 4 Star, 5 Star, and Deluxe accommodations. All services in Atacama, Punta Arenas, and Torres del Paine are operated on a group basis. Elevations: Santiago is 1,700 feet above sea level, Atacama is 8,005 feet, Socaire is 10,498 feet, Minique and Miscanti Lagoons are 13,615 feet, Tatio Geyser is 14,107 feet, and Torres del Paine National Park elevations can reach 4,000 feet or more, depending upon your itinerary. Passport/Visa: U.S., Australian, Canadian, and EU citizens (except Greece) require a valid passport (for the duration of your visit) and return ticket for stays of up to 90 days. Greek citizens can stay for up to 60 days. Australian, and Canadian citizens are required to pay a reciprocity fee (considered a multiple entry visa) of $95 and $132 respectively upon arrival (subject to change without notice due to currency fluctuations or other reasons). Citizens of other countries are advised to contact the Chilean embassy in their country before traveling. To Book This Trip: We require a non-refundable deposit of $800 per person plus the cost of the airfare (if we arrange it for you). For Single passengers and 4 Star, 5 Star, and Deluxe accommodations a more substantial deposit is required. Ask your travel counselor for the details.